We can be distinguished from the rest by the continued investment into a specialized abalone feed over the last 20 years. Since 1994 Marifeed has continuously strived to improve the abalone feed supported by the Department of Ichthyology and Fisheries Science at Rhodes University. The research has been of such a standard that government institutions, through the THRIP fund, have continuously supported the research financially. Research has not only been in the formulation of feed, but has been at a level where the abalone itself is studied in order to fully understand the nutritional requirements needed. Marifeed spends at least 10% of its annual budget on research and development, one of the reasons why ABFEED is the world’s leading abalone feed. Growth rate, FCR and yield after processing were all superior when feeding with Abfeed, as opposed to a kelp (Ecklonia maxima) diet or a mixed diet of kelp and Abfeed. With a mixed diet the cooked and raw meat yield was still 8.5% higher than fed with kelp only. In comparing the 34% protein diet (S34) with K26, a 26% protein formulation, the higher formula produced a slightly higher growth rate. FCR and canning yields did not differ significantly between the two formulations. This work has now been carried forward in the development of an improved formulation containing 26% protein, called ES26. Rowan Yearsley reports below on trials conducted with H. midae fed Abfeed ES26 and Abfeed S34. In essence these farm trials show that no difference could be found in the growth rates, Food Conversion Ratio or canning yields between S34 and ES26. Abfeed ES26 has a Forage Fish Efficiency Ratio which is < 10 and complies to the Aquaculture Stewardship Council standard for environmental sustainability. Abfeed ES26 with its lower protein content, has a lower impact on water quality in farming systems. This diet is used by farms making use of a water re-circulation system. In 2013 the price of fishmeal increased drastically and there have even been supply shortages. This can trigger the question, “Why not use seaweed instead of fishmeal-based formulated feeds?”. They fuel good growth and give improved processing yields. Their supply and quality is consistent, while that of seaweed is not. Formulated feeds can also be easily stored for long periods of time. Less labour is required for feeding. Seaweed is sometimes harvested from the sea close to other farms, while formulated feeds are less likely to transfer an infection to the abalone. Formulated feeds can be customized to suit the abalone and the farming system. At present the majority of South African abalone are produced on formulated feeds and clearly these feeds are here to stay. The challenge then is to reduce the feed’s reliance on expensive protein sources such as fishmeal. The efficiency with which fishmeal is converted into aquaculture product is typically assessed by looking at the Forage Fish Efficiency Ratio (FFER) or Fish-In-Fish-Out Ratio. Both mean the exact same thing and are a measure of how many kilograms of wild fish need to be consumed to produce a kilogram of aquaculture product. In order to develop a diet with an FFER of below 1, Marifeed collaborated with Dr Cliff Jones and Prof Peter Britz of Rhodes University to test a range of candidate diets based upon the original Abfeed K26. After numerous growth and processing yield trials at two local abalone farms, this research has produced a 26% protein diet which contains far less fishmeal than is present in Abfeed’s S34 diet and which achieves an FFER of below 1. In addition, the diet gives equivalent growth to Abfeed S34 for abalone from 0.3 g and larger. Marifeed calls this diet Abfeed ES26; the ‘ES’ standing for ‘environmentally sustainable’. The following is a description of the results obtained from comparisons between this diet and Abfeed S34. A number of controlled production trials where run in collaboration with Rhodes University in which abalone of a range of initial sizes (0.3 g, 11 g, 28 g, 38 g, 40 g and 73 g) were fed either S34 or ES26. The growth-rate, Feed Conversion Ratio, FFER and processing yield of the abalone on the different diets were compared. All trials were conducted at commercial densities in standard tank and basket systems at Aquafarm and HIK Abalone Farm. The basket systems contained feeder-plates upon which the feed was fed. Feed was given every afternoon as required. 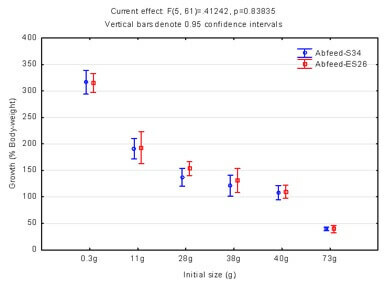 The growth of the abalone fed ES26 was at least as good as that of the abalone fed S34 for all size classes which we tested (0.3-73 g). The graph below shows the ANOVA means and 95% confidence intervals for growth (in % of initial body-weight) of abalone of the various initial sizes fed either ES26 or S34. The 0.3 g size-class was grown for 3 months during which time their initial weight more than tripled, the 11-40 g size-classes were grown for 8 months and the 73 g size-class was grown for 4 months. In all cases there was no significant difference in growth between abalone fed the two different diets. Figure 1. Growth of abalone of various sizes when fed Abfeed S34 or Abfeed ES26. Processing yield is just as critical as abalone growth. At the end of the growth trials abalone of two different size-classes (55 g and 99 g) were sent for canning in order to compare the yield of abalone of these sizes which had been fed either S34 or ES26 (Figure 2). The graph shows the weight of meat at different stages of the canning process, as a % of the total live abalone weight after purging. For the final measurement i.e. ‘post-canning’, cans were opened in order to measure the drained weights. As can be seen, the ES26 diet did not affect the processing yield. Figure 2. Processing yield of abalone of 55 g and 99 g when fed Abfeed S34 or Abfeed ES26. The Forage Fish Efficiency Ratio obtained with the ES26 diet averaged 0.88 kg of fish for every kg of abalone produced. The S34 diet was less efficient. Farmers must be careful to adjust their feeding technique when using this diet. Because the pellet has a different formulation, it takes on a slightly different shape when extruded. As a result, a standard feeding cup filled with ES26 can contain up to 15% more feed than one filled with S34. If farmers do not adjust the size of their feeding cup and train their feeding-staff accordingly, their staff are likely to over-feed the ES26 diet. If farmers would like assistance with setting up their own production trials with this diet, they are welcome to contact Marifeed for advice. This report has been shortened for practical reasons. Further details can be obtained from Rowan Yearsley. FRESH KELP AND A COMBINATION DIET ON FCR, GROWTH-RATE AND MEAT YIELD OF HALIOTIS MIDAE. 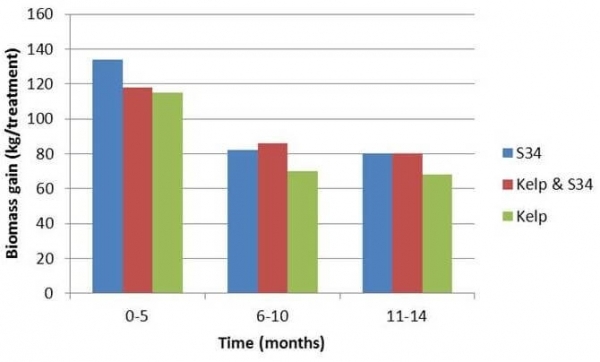 The primary objective of this growth trial was to determine the effect of the Abfeed diet, relative to the seaweed kelp, on the growth, Feed Conversion Ratio and processing yield of the South African abalone (Haliotis midae) on a commercial abalone farm. The standard S34 dry formulated diet (used as a control). A combination diet of fresh kelp and Abfeed S34. The trials were run over a 14 month period in three phases from January 2005 to March 2006 at Aquafarm Development. Abalone were kept in 6 mm oyster-mesh baskets in a commercial production system. All normal farm production procedures were applied during the trials. Three replicate tanks were used for each treatment. During phase 1 (0-5 months), abalone in the 15-25 g weight range (48-49 mm) were used. For phase 2 (6-10 months), abalone in the 40 g weight range (60 mm) were used. For phase 3 (11-14 months), abalone in the 65-68 g weight range (70-72 mm) were used. Abalone were stocked at commercial densities and these were standard across all treatments. The abalone of each basket were weighed at the beginning and the end of each phase of the trial, to determine the start and end biomass. From this data, the average weight and length of the abalone in each basket was determined. The abalone were fed on demand. More formulated feed was given when less than 5% of the feed ration remained on the feeding-plates. Fresh kelp was given when less than 10% of the ration remained in the baskets. The combination diet treatment involved feeding Abfeed twice a week and kelp once a week. The overall production of abalone was highest in the treatment fed S34 and a combination diet of S34 and kelp. Over the course of the 14 months the abalone fed kelp only consistently performed poorer than the abalone fed S34. The production for each treatment, during each phase of the trial is shown in Figure 1. The abalone fed S34 required an average of 0.92 kg of feed to produce one kilogram of abalone (Fig. 2). With the combination diet it required 0.39 kg of Abfeed and 7.23 kg of kelp to produce one kilogram of abalone and abalone fed only kelp required 12.0 kg of kelp for every kilogram of production. Figure 1. Production of abalone in treatments fed Abfeed S34, kelp or a combination diet of S34 and kelp. Figure 2. 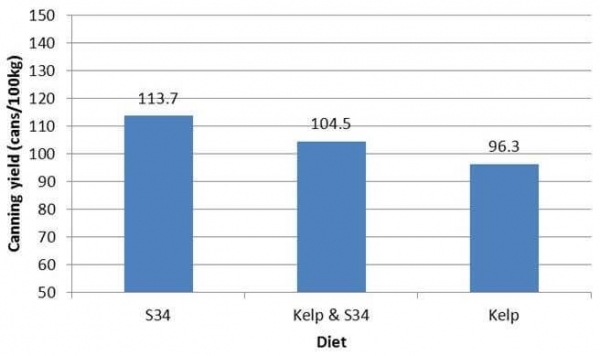 The Feed Conversion Ratio’s of abalone fed Abfeed S34, kelp or a combination diet of S34 and kelp. After the last phase of the trials, the abalone were sent to the canning factory in order to determine the processing yield. The abalone were weighed in at the factory ca. 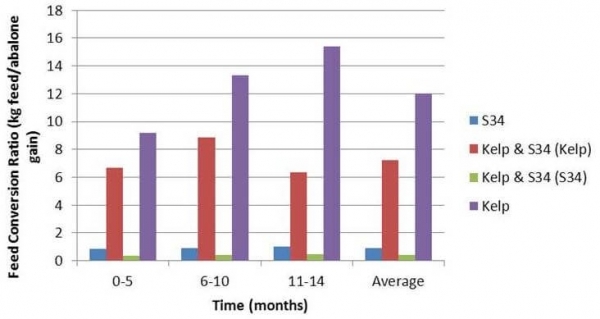 1 hour after being removed from their purging tanks and the yield was calculated as the number of cans produced per 100 kg of abalone delivered (Fig. 3). Figure 3. Canning yield of abalone fed Abfeed S34, kelp or a combination diet of S34 and kelp. The treatments which were fed Abfeed had greatly improved canning yields. These results showed that by feeding the Abfeed diet, farmers will get 18% more canned product from the same amount of abalone. This is because abalone fed formulated feeds lose less body fluid during salting. In addition farmers can anticipate a further improvement in yield of abalone fed S34, relative to those fed kelp, because when the cans that are filled with abalone are cooked, the abalone fed S34 lose less weight. This was not accounted for here. Therefore to conclude, by feeding the Abfeed diet S34 growth-rate, Feed Conversion Ratio and canning yield are all improved, relative to abalone fed kelp. Imtiyaz Ismail (BSc Hon. student) – Movement towards the development of an artificial weaning diet for the South African abalone (Haliotis midae). Steven Benjamin (BSc Hon. student) – The effects of pellet size on the behaviour and growth of juvenile dusky kob (Argyrosomus japonicus). Alice Johnson (BSc Hons. student) – The effect of age and size on cultured abalone (Haliotis midae) gut enzyme activity in early weaning. Alistair Green (MSc Student – The development of a high temperature maintenance diet for the South African abalone Haliotis midae. Alice Johnson (BSc Hons. student) – The effect of age and size on cultured abalone (Haliotis midae) gut enzyme activity in early weening.